Tiller, very nice and organized! Would it be alright if I used it as a base for the next version of my transit map? Here is my current one-https://www.flickr.com/photos/141802592 ... ed-public/. As you can see its a bit disorganized. I agree, it is an aesthetically pleasing and well-constructed map (the original map and its creator(s) are still credited in the lower right, as I didn't come up with the design), and I have no problem with you using it as a base. There's still some tweaking I'll do like fixing fonts and reworking the aBRT/bus elements, though this link is what I've done so far (with plenty of formats, though the original is the .ai file for adobe illustrator). Beautiful map, but why reassign Red Line to the not-yet-built Riverview Corridor, and declare existing Red Line as Pink Line? 1. Orange Line will have stop at 76th as well as American, and I can't see any reason why the utility of that stop would change by 2030. 2. 38th St station would be a nice addition. 3. Short of drastic land-use and urban design changes on the Bloomington strip, it's hard to picture the 542 as a more useful transit corridor than the 515 on 66th. (This map actually shows a net reduction on the 515, which is currently high-frequency to Richfield Pkwy.) 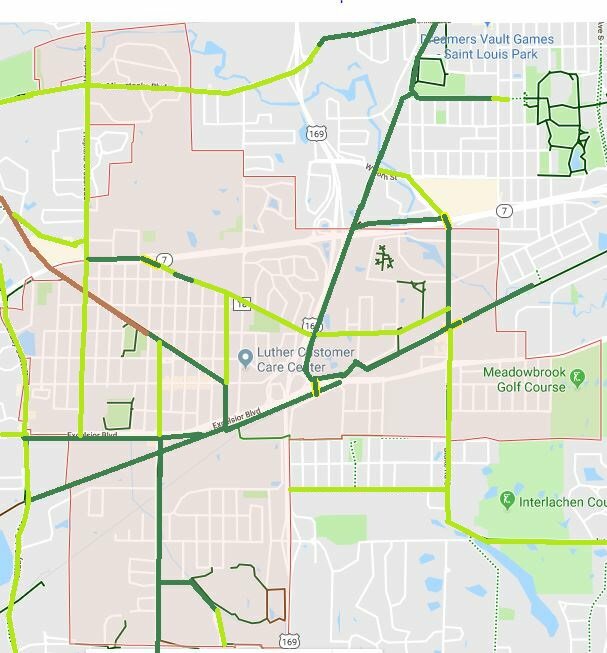 66th is the first major transit corridor south of Lake St, and it seems like improving the east connection to the Mall would make the most sense. Richfield's planned Richfield Pkwy and 77th St underpass means that the 515 could proceed south on Richfield Pkwy/18th Ave to 77th St, and get over to the mall relatively quickly. 4. Direct transit access up France from Southdale to West Lake Station would be awesome. 5. Would be nice if aBRT routes were distinguished. 3. Plymouth Ave N station added. I don't know if this is his reasoning, but I will say that the colors chosen for the Red and Orange lines look awful right next to each other. Why not interline Silver and Gold Lines via 94, replacing the Rt. 94 as a DT-DT Express? I guess it might be a long distance, operationally, but without stops between the downtowns, end-to-end time might not be much longer than the extended Green Line. Yes, I've suggested similar ideas before even for express buses heading from East Metro to St. Paul - We should have a designation for buses that go express from DT to DT (and should only charge a local fare for that segment) and interline existing express buses to Mpls via St. Paul and vice versa. This would allow slightly higher frequency on these routes or even consolidation where there are separate routes to St. Paul and Minneapolis from the same transit station. Might sound like a good idea, but I think the logistics would be terrible. It looks like there is one bus that does this... Rt 353 from Woodbury to downtown Minneapolis via downtown St Paul. Only one trip leaving Woodbury at 5:41 am. I don't see the Eastbound return trip listed. Odd. 351 from Woodbury to downtown St Paul, has 5 WB trips in the am and takes about 25 mins. 355 from Woodbury to downtown Minneapolis, has 12 WB trips in the am and takes about 40 mins. I take the bus from WBL each day. I'd NEVER go to Minneapolis via St Paul. The 270 (WBL to Mpls) travels on 36 to 35W. When/if the Rush Line opens I will not be considering it as an alternative. To take that south to Minneapolis, transfer to the Green Line, it would nearly double my commute. Maybe you only meant this for the buses that travel through one DT to get to the opposite DT. The 353 is a combination trip of the 351 and 355 at a time when demand is lower and separate routes cannot be justified. I like the idea of sending the Gold or Purple/Rush line down I-94 to Minneapolis, because it will really help connect the East Side/Metro to Mpls. The big problem is going to be reliability, especially during weather events and rush hour traffic. Once the MnPass lanes and direct connectors to each downtown are built, it might not be as big of an issue. In any case, a separate route for I-94 (i.e. the 94 bus) could be a better alternative, because there is going to be a lot of turnover in Downtown St. Paul. I live near Payne Ave and applied for a job by Nicollet Island. Fastest route is #61 (1hr 1m). 64->94->6 is about 8 minutes slower. I wonder if the Rush Line added the #94 route if it would make up that lost time. If the job were further SW in DT MPLS I'm guessing the #61 would be the slower route, but there are no transfers. 94 Express frequency is not too high outside of rush hour. Is the idea to replace it by extending several other routes (or just one high-frequency BRT route)? Here are some maps I made of potential stations on the Dan Patch Corridor, three of the stations could be used by other regional rail lines (Target Field or West MPLS and West End) and one of the stations is adjacent to another potential regional rail line (Savage). Thanks Dan! Those are amazing! After looking at some of the transit maps both new and old, I'm starting to wonder if a transit line could be added on the 494 loop with buses/trains running clockwise and counter clockwise. How many transit lines to the suburbs are we talking? Looking at my most recent map there are fourteen BRT or LRT crossings of the 494/694 belt. One route goes along 494 between Mall of America and Eden Prairie. Add in ABRT and that would be one or two more routes. What has discouraged me from a belt route is the failed Route 494 bus, but that was planned poorly with the assumption that people would be willing to transfer to/from inconvenient local buses at suburban park & rides which have little if any land uses surrounding them. While not BRT or LRT, I do think it would be worth trying something similar but a limited-stop service similar to Routes 535 and 645. Its not express and it definitely wouldn't be the fastest, but express service skips many potential riders and we end up with 2 or 3 people per bus (I believe that was the ridership of Route 494 during its short life). Like I said a good twice as many maybe more (so 28+ routes that cross the 494 belt), so a long way off even for fantasy maps. I wasn't suggesting it stay on the 494 belt at all times but loosely follow it to connect to local stations near the belt. There would be a lot of routes close together, and if any of them are like the current Red Line in terms of ridership they wouldn't be in the High Frequency Network for long and end up as glorified bus routes. But as I said before, a limited-stop service around the belt serving destinations and transit stations near the freeway has a fighting chance of doing well once we establish more hub-spoke rapid transit routes and adding more service to local routes, and we won't need 25+ rapid transit routes crossing 494/694. S-Bahn style regional rail system in the Twin Cities region. I'm currently in the process of making a state map of regional and intercity rail routes.